Written when Orwell was a struggling writer in his twenties, this novel documents his 'first contact with poverty'. Here, he painstakingly shows a world of unrelenting drudgery and squalor - sleeping in bug-infested hostels and doss houses of last resort, working as a dishwasher in Paris's vile 'Hôtel X', surviving on scraps and cigarette butts, living alongside tramps, a star-gazing pavement artist and a starving Russian ex-army captain. Exposing a shocking, previously-hidden world to his readers, Orwell gave a human face to the statistics of poverty for the first time - and in doing so, found his voice as a writer. This account is wonderful, but horribly, horribly depressing at the same time. 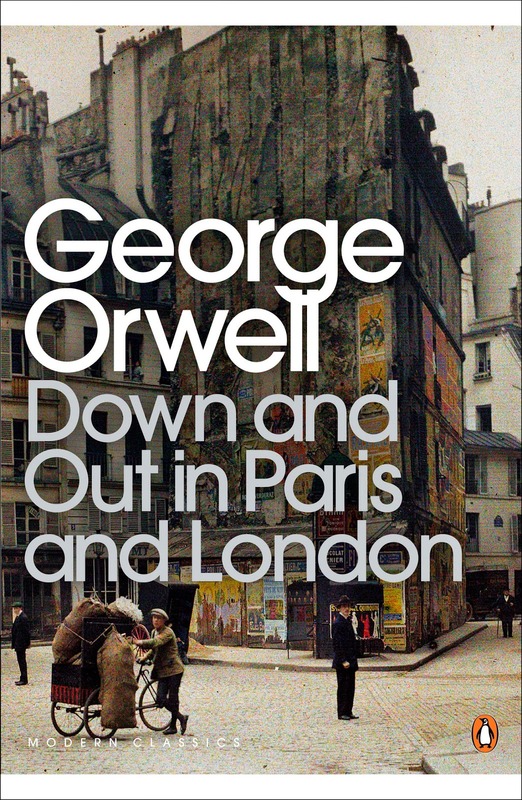 Orwell gives us an semi-autobiographical account of his years in poverty in both Paris slums and London workhouses. His accounts are shocking and grimy, but full of life, character, and sheer resilience. Although aspects of the book read like diary entries of Orwell's time mired in poverty, some chapters are reserved for his own opinion on the situation, and turn discursive. He translates London slang for us, gives his opinion on Parisian plongeurs, and even makes suggestions on how tramps could be further supported by changes in the law. There is no 'high and mighty' feel at all, and these pontifications add so much more to the essay by making the reader think on the political aspect of poverty, language, and Orwell's unlucky situation in general. The sights and smells of poverty are portrayed wonderfully. Orwell bundles you into the poorhouses with him, and explains how his unwashed peers smell, how the hard stone floors feel to sleep on, how incredibly difficult and disgusting it is to attempt to sleep with the breath of another man in your face. He shows us his days without food and the suffering that comes with these. We see how hunger can evoke fights and violence, and how important a penny in one's pocket really is. Although we are given statistics on the staggering numbers of men and women living in poverty at this time, Orwell really humanised them and showed them to us as those who have run into bad luck. He explains that many of the tramps would relish a day's work; they simply can't find any work to bring them out of their situation. He explains many are taken for alcoholics, but although some would love to drink all day, they simply can't afford to. His sympathy is apparent, and this glides, by proxy, into the feelings of the reader. This is something everyone should read, for realisation purposes. Although I was aware poverty is very much still 'a thing', reading of these experiences in the 30s was shocking, and really opened up a thought process on how it looks now. At the end of the book, Orwell says he feels he's only seen 'the fringe of poverty'. If that was the fringe, how far deeper does it go? If Orwell only saw the fringe, that means you and I are far luckier than we have ever imagined, and know nothing of the real world of poverty.